The cruise port in Valletta Malta is called the Cruiseliner Terminal. It is located on the Grand Harbour within walking distance of downtown Valletta. The picturesque terminal is located between the Valletta City Walls and the harbour. There is a pleasant mall with shops, restaurants and cafes located along the waterfront. 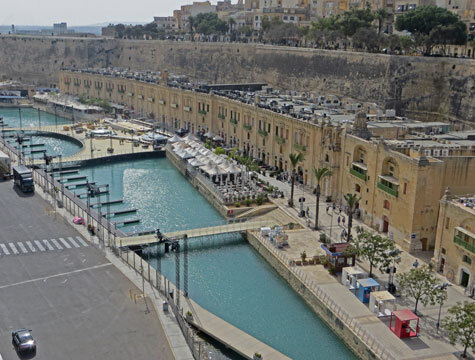 This area is sometimes referred to as the "Valletta Waterfront". To walk to downtown Valletta, cruise passengers can stroll east along the waterfront and then make a sharp turn up It-Telgha tal-Kurcifiss road. This steep road leads directly to town. If you take the staircase on the right side of the road, you'll enjoy a pleasant (but steeper) climb through the Hebert Ganado Gardens. View map of the Valletta Malta Cruise Terminal.